Kelp Noodles - Are These Noodles the Next Wonder Food? An alternative to traditional pasta, kelp noodles are typically made from three ingredients: kelp (an edible brown seaweed), water, and sodium alginate (a brown-seaweed-derived substance used to improve the texture of many foods). The translucent, wheat-free, and gluten-free noodles are low in calories and carbohydrates. Kelp noodles are used in a variety of traditional recipes including a Korean side dish made by tossing the noodles with a garlicky mayonnaise, toasted sesame seeds, sea salt, and other ingredients. Kelp noodles are often marketed to people following a gluten-free diet or low-carbohydrate diet. In addition, kelp noodles are considered a favorite among adherents to a low-FODMAP diet. In a study published in the Journal of Human Nutrition and Dietetics in 2018, researchers analyzed the FODMAP (a class of carbohydrates said to trigger digestive complaints in some people) content of 35 foods and did not detect any FODMAPS in a sample of kelp noodles. Some kelp noodles are marketed to people who adhere to a raw food diet. However, not all kelp noodles are considered raw (they are usually steamed at varying temperatures), so read the label or go to the manufacturer's website if you are looking for raw kelp noodles. Proponents claim that kelp noodles offer a wide range of health benefits, partly due to their iodine content. For instance, kelp is sometimes said to improve thyroid health, promote weight loss, reduce inflammation, and enhance heart health. Kelp noodles, being low in calories and carbohydrates, may help some people manage their weight. However, there haven't been any clinical studies examining whether consuming them can aid in the prevention or treatment of any health condition. Most kelp noodles contain fewer than 10 calories per serving. Kelp noodles do not contain cholesterol, protein, gluten, wheat, or sugar. Per serving, they typically have 1 gram of carbohydrates, 1 gram of fiber, and 35 milligrams of sodium. In addition, kelp noodles typically provide 15 percent of your daily calcium needs and 4 percent of your daily iron needs per serving. Kelp is considered a top source of iodine. A trace mineral and essential nutrient, iodine plays a key role in metabolism and thyroid function, and inadequate iodine intake can lead to thyroid problems, such as hypothyroidism. To reach your daily iodine needs (150 mcg per day for most adults), the National Institutes of Health (NIH) recommends following a balanced diet that includes seafood (especially cod, sea bass, haddock, and perch), kelp and other sea vegetables, and limited amounts of iodized salt. Besides kelp, other commonly available iodine-rich sea vegetables include the seaweeds wakame, arame, and hijiki. There are two types of kelp noodles: green and clear. Green kelp noodles have the consistency of al dente pasta and taste like seaweed. Clear kelp noodles (the more popular type) have a relatively bland taste, but some brands have a slightly salty and bitter taste that can be reduced somewhat with thorough rinsing. They are crunchy in texture. After opening a bag of kelp noodles, rinse the noodles well, which helps to remove the mildly salty liquid the noodles are packaged in and separates the noodles. Drain the excess water. The noodles are long, so you can cut them down to a more manageable length with kitchen shears or a knife and cutting board. They can be used raw or cooked. How to Soften Kelp Noodles: To reduce the crunchiness of the noodles and give them a softer texture more similar to al dente pasta, try adding one tablespoon of lemon or lime juice or vinegar to the boiling or soaking water or using acidic sauces like tomato sauce. Kelp noodles are typically used like regular pasta, with pesto, alfredo, marinara, mushroom, and spaghetti sauce. 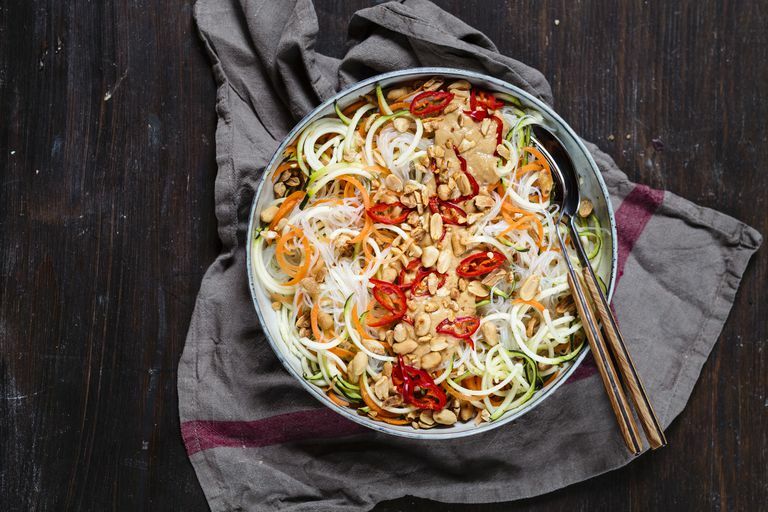 You can also use them in Asian cuisine, such as pad thai, peanut sauce, almond-ginger dressing, coconut milk curry, yakisoba, pho, japchae, or ramen soup. Some people may experience bloating, diarrhea, gas, or an upset stomach. Since kelp noodles are low in fiber, using them as a regular substitute for whole-grain pasta or brown rice may significantly reduce your fiber intake. The NIH currently recommends that older children, adolescents, and adults consume 20 to 35 grams of fiber per day. Inadequate fiber intake can cause digestive problems and may contribute to a number of health conditions, including heart disease and diabetes. Although adequate iodine intake is needed for thyroid health, getting too much iodine may have a negative impact on thyroid function. Besides seaweed, other foods that contribute to your total iodine intake include fish, dairy products, grain products, fruits and vegetables, and iodized salt. According to a UC Davis study, kelp supplements may contain high levels of arsenic and other heavy metals such as aluminum. The levels of contaminants in kelp vary depending on where it was harvested. According to the UC Davis study, the concern is mainly with kelp supplements rather than kelp from food sources: "While long-term human exposure to arsenic from food sources such as fish does occur, it is usually significantly lower than anything approaching toxic levels. However, dietary supplements, which are largely unregulated, have raised health concerns." If you are pregnant, consult your health care provider to see if you can eat kelp noodles during your pregnancy. The flesh of spaghetti squash separates into noodle-like threads when cooked. Zucchini can be put through a spiralizer to create zucchini noodles (sometimes called "zoodles"). Shirataki noodles are made from the root of the konjac yam (a plant grown throughout Asia). They are another popular noodle substitute. Shirataki noodles are high in glucomannan, a type of fiber found to reduce LDL cholesterol in several studies. Some shirataki noodles are made with tofu (to improve their taste and texture). Unlike kelp noodles, shirataki noodles can have a slightly fishy smell when uncooked or unrinsed. A Korean noodle dish called "japchae" is made with transparent noodles made from sweet potato starch and water. Glass noodles, also called cellophane or bean thread noodles, are made of starch from mung bean, yam, potato, cassava, or canna. Rice noodles are made from rice flour and water. Although kelp noodles aren't easy to find in grocery stores, they may be in the refrigerated section (near the tofu) or in the Asian food or noodle aisles. They are also available for purchase online. Fat-free, gluten-free, egg-free, soy-free, and very low in calories and carbohydrates, kelp noodles may be a good option for you if your eating plan requires you to seek alternatives to pasta and other noodles. Since kelp noodle labels don't indicate the iodine content, if you do try them, it would be wise to eat them only occasionally. Also keep in mind that the noodles contain almost no dietary fiber. If you are interested in trying other gluten-free, low-calorie noodle alternatives, consider trying zucchini noodles or spaghetti squash. Sood N, Baker WL, Coleman CI. Effect of glucomannan on plasma lipid and glucose concentrations, body weight, and blood pressure: systematic review and meta-analysis. Am J Clin Nutr. 2008 Oct;88(4):1167-75. Tuck C, Ly E, Bogatyrev A, Costetsou I, Gibson P, Barrett J, Muir J. Fermentable short chain carbohydrate (FODMAP) content of common plant-based foods and processed foods suitable for vegetarian- and vegan-based eating patterns. J Hum Nutr Diet. 2018 Jun;31(3):422-435.